The current speed of destruction of the Făgăraș primary forest is truly alarming. It is obvious that there is no time for long discussions, because one of the most valuable natural places in the EU is disappearing right before our eyes. Researchers from from the Faculty of Forestry and Wood Sciences, Czech University of Life Sciences, in Prague conclude their several years of monitoring work with the statement that solutions are needed as fast as possible. The Făgăraș mountains host around 10 000 hectares of the of old growth forest. This is likely the largest area of old growth forests in the entire EU. The Făgăraș mountains also host large areas of valuable natural forests connecting the old growth forests into larger complexes of high naturalness. 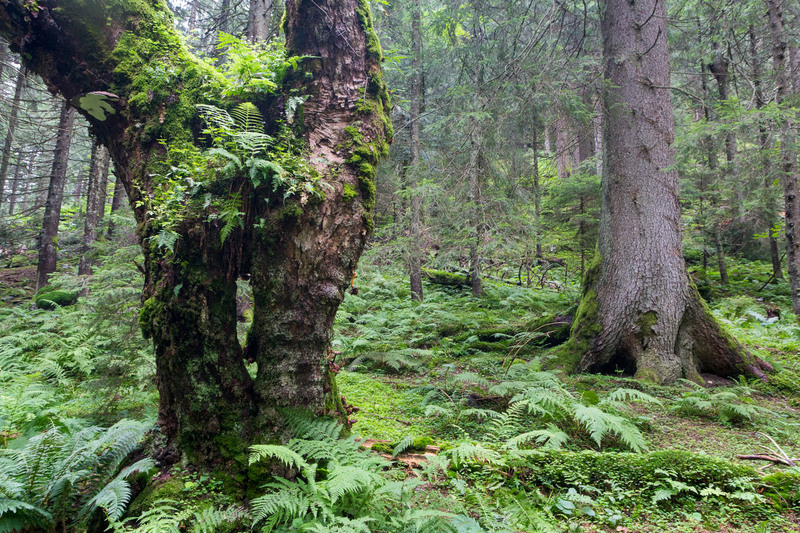 The old growth forests in Făgăraș used to be protected by its remoteness, inaccessibility, and steep and rough terrain. The team of Czech researchers has had a focus on research and monitoring in this corner of the Carpathians already for several years. Their project REMOTE (REsearch on MOuntain TEmperate) Primary Forests is a long-term international collaboration based on a network of permanent sample plots in the forests of Central, Eastern, and Southeastern Europe. ‎⁨They recently published a report “Destruction of the largest complex of primary forest in EU: the Făgăraș Mts”. This report and their work provide an additional piece to the larger mosaics illustrating the destruction process of the Carpathian forests. Not only in Romania but also in Ukraine and Slovakia. Such work is extremely important as it is based on scientifically sound methodology. The systematic monitoring provides reliable data which can be compared through the years. The report is full of arguments debunking the contrary argumentation of the Romanian Forest service. They claim that for example the particular old untouched forest is not subject of protection because their experts did not find elements of virgin forest there. They further argue that there is not enough dead wood and therefore logging can get a green light. The Czech researchers however confirmed that only a couple of years ago, when the permanent study plots were installed, the valleys were nearly untouched, road less and without industrial logging. Ondrej Kameniar from the research team describes it as Wilderness. Unfortunately, a lot has changed since then. The drastic change deriving from extensive logging of the old growth forests, the construction of roads and large clear cuts significantly impacted the former healthy and wild ecosystem. The researchers and their ongoing work documented this drastic change and the loss of biodiversity and important habitats. However, their last visit in the Făgăraș mountains ended with punctured tires. This shows that there seem to be people who are not happy about their presence and work their. People start to understand that despite of many reports, articles and inspection trips to the primeval and old-growth forests in Romania these forests are and likely to be subject of intensive logging in the coming years. Particularly striking is the fact that it basically does not matter if a forest is inside or outside of a protected area. The whole process just seems to be subject of creative zoning and good argumentation. Sign the petition to stop this destruction here! Protected areas often protect only fractions of these valuable forest. Small fragments, inherited from previous small strict reserves, are left in remote areas, close to the tree line. These remnants are mostly part of the protected area’s core zone, offering the strictest form of protection. Other old growth and primeval forests are included either in transitional or buffer zones of protected areas. This consequently means that they will be a subject of legal active management measures sooner or later. Active management measures are often though to be necessary in order to help nature. Many managers believe these activities are saving forests and that otherwise the forests will be impacted by natural disturbance, which is interpreted as destruction. This management approach often results that even forest in protected areas are subject of harvesting. However, natural disturbances are a fundamental element of forest dynamics and should therefore be protected. Particular, protected areas should be places where natural dynamic process can happen in an undisturbed way. An unfortunate consequence of this process is that the public starts to believe that active management is necessary for keeping forests healthy in particular areas. As a consequence a lot people believe that old growth forests need the help of managers to survive. Forests have been covering our earth for millenia, surving all kinds of disturbances and adapting to them. These forests, particularly after any disturbances, might not fulfill our ideal picture of a healthy forest. However, people need to learn that the time scales of a forest are not the same as of us humans and that it can still be healthy even after an avalance or a beetle infection. Lying dead trees, for example after a windstorm, will be decaying and turn into soil, offering nutrients for other trees and plants as well as a home for many insects and fungi. Despite of all disturbances forest have revived in the past and will keep to revive. Through this ongoing and undisturbed adaptation process natural forests are more likely to adapt to the changing climate as well. In order to be able to study and understand this evolutionary process of adaptation, large areas of untouched natural forests without active management are necessary. These areas are subject of research studies and classrooms, not only for foresters and scientists but for all of us.